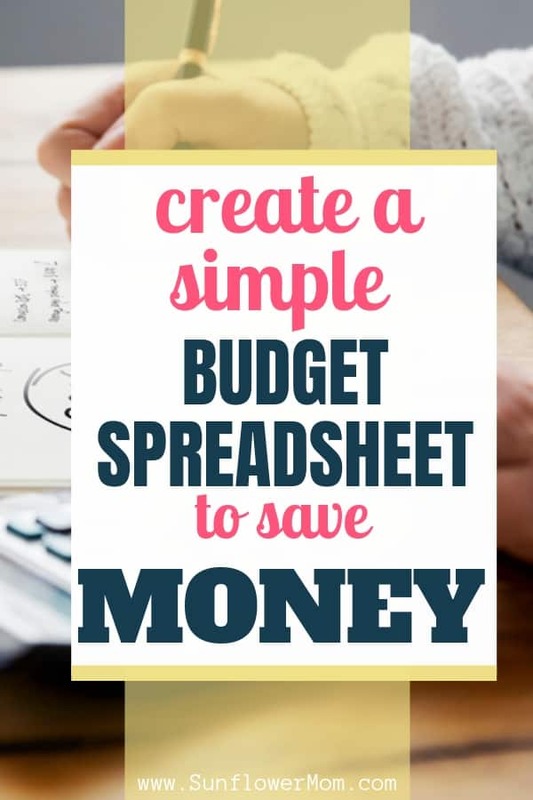 How to create a simple budget spreadsheet with step by step instructions and free templates. Budgeting that works and finding freedom in your finances with easy budget spreadsheets. Do you often hear “you need to make a budget,” but when you sit down to create a budget you’re lost? Or your idea of making a budget is randomly cut down on online spending then forget about it? The information below is designed to walk you through how to create a budget spreadsheet step-by-step. Budgeting is so much more than willpower and swearing off your morning mocha. For the first three months, you will merely monitor your spending and write down all your purchases. You can break them down in the categories below of Fixed and Variable. At this point try not to restrict yourself or your family members too much. You need actual, real-life data from the past three months or longer to see how you and your family spend money before you begin imposing restrictions. not paying off bills fast enough which could make you give up. If you use you a credit or debit card for all your spending, then your expenses will already be tracked. All you need to do is log onto your credit card or debit account and export the detailed information for each month. Go back at least 6-12 months if possible. Having a year of data will allow you to see trends of birthdays, holidays, summer, school and more. If you mostly use cash or a combination of cash and cards, then for the next three months write down how much you spend in the categories below. Bonus: Download a free worksheet from the resource library to work through this with calculations and room for 6 months of data. 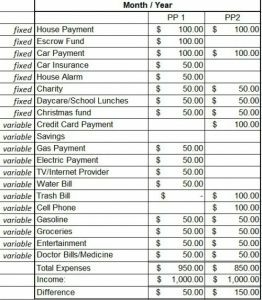 These are expenses that change each month and the ones you have the most control over. These expenses are the ones that don’t change or the ones you don’t have much control over, although sometimes you can opt to pay more. You don’t necessarily need 3-6+ months of data to fill this category in and for this reason it isn’t inside in the worksheet. You can gather this information from last month’s bills. You most likely won’t find substantial savings in these areas, although there is some room, see below. Once you have gathered 3-6+ months of your spending data, figure the monthly average for each category. The worksheet in the resource library walks you through this. Look for areas to cut in your budget. Are any of the categories higher than you expected? Are any of the categories higher than other categories in ways that don’t make sense? For example, is Meals Out higher than Groceries? 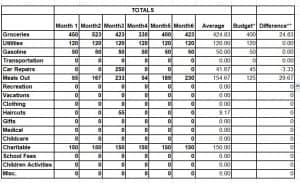 Compare month to month for some categories. Did you overspend one month for a specific category that brought your whole average over? Is there an entire category you feel your family can do without? Do you feel all your spending is under control? If so there are a few ways to approach this. There is almost always room under Fixed Expenses for improvement for everyone. One obvious but unpopular way is cutting out cable. I don’t have cable, so I’m here to tell you it’s very much possible to live without it. Another unpopular place to save under Fixed Expenses is with our Internet and Phone bill. For more ideas check out 44 ways to easily save money. Your spending may be under control, but that doesn’t mean you don’t need a budget. In this case, take your averages as they are today and move forward with a budget, without cutting anything. This will prevent your family from going into debt. Anytime you have above the amount in a particular category; you can place that amount in savings or add to your house payment, for example. If your spending is under control and you’ve cut what you could from fixed expenses but still know you need more cash flow, you may need a temporary second job or need to take advantage of government assistance. Once you’ve identified areas to reduce spending, look at the months you spent the least. Is this a reasonable amount for your budget or should you go even lower? Write your new amount under each variable column for your new budget amount and then calculate the approximate difference from the average. See Budget Spreadsheet – Variable Expenses in the resource library. This amount will be an approximate amount since we’re taking a 3-6+ average and subtracting it from a projected amount. But you need to start somewhere. Now you have a rough idea how much overflow you will have each month. Will this extra amount be enough to pay down my credit cards or debt? If so, how much extra can I pay off each month and when would my credit cards be paid off? Concentrate on one credit card at a time if you have multiple. Pay off the one with the lowest balance first, paying the minimum payment on the other ones. Once you’ve paid off the first credit card then move to the 2nd lowest balance, paying the amount you were putting towards the first loan plus the balance you were spending on this one. Continue this way until they are all paid off. If you don’t have any debt, what will you do with this extra money? Create a plan for it now. Depending on how often you receive a paycheck, take this money and place it in a savings account for vacation, a future car, your child’s college, etc. Before your budget is complete, you need to make it practical. Find out the due dates of all your bills (fixed expenses) and consider how often you’re paid and which days. Then draw out a simple plan like this below. Get this template from the resource library and make it work for you. 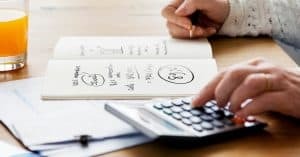 Plan out which pay period you’ll pay each fixed expense and when you’ll take out money for your variable expenses and when you’ll set aside to save or pay off the extra amount in your budget to your debt. If you’re unaccustomed to having a budget, chances are, you’ll need to work this out on paper or a computer every pay period for a while. It took me five years before I didn’t need to plan out my money each month ahead of time. At the beginning of each pay period, it’s helpful to plan out exactly how much you can spend on each variable expense. 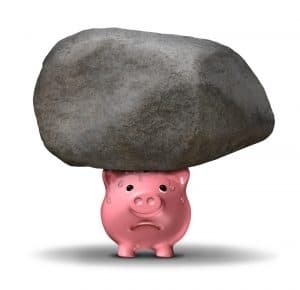 If the next pay period you still have money left over from the previous time, you can either add to it or take less out and add the extra to pay off your debt. Because this gets tricky real fast, I find it much easier to use cash for all my variable expenses. This also prevents me from using “extra” because “it’s almost payday” or because “I deserve it” or whatever excuse I can be good about coming up with. You’ll be surprised how much quicker you’ll pay off debt and save money this way. You may keep a budget spreadsheet for a couple of years or for the rest of your life. I found I enjoyed tracking where my money went once I figured out how to create a budget spreadsheet and use it. Budgeting allows you to control your money instead of your money controlling you. Don’t forget to download your free resources from the resource library and good luck!